It’s a bit odd to me that I am posting a recipe for cheese paste, because if it’s one food item in the Trini repertoire that should be entirely freeform in its construction, it’s this ubiquitous sandwich spread. But I made it recently and I thought, why not? It’s more than just a sandwich spread really. Sure, everywhere there are sandwiches on offer, you’re bound to find cheese paste – at school parties, tea parties, lunchkits, at the Oval for those who didn’t wake up early enough to cook (or like food they can eat without a plate) or in the North Stand for Panorama. But cheese paste finds its way into puffs, and on toast, where the butter can melt and the cheese softens to create quite a different taste and texture experience. Just crix and cheese paste is such a staple in our food culture, that it was on offer at the Taste of T&T! Everyone makes their cheese paste differently, to their individual tastes, following methods handed down by their parents, or borne from late night cravings and experimentation. We all have our preferences, many strongly held to the point of fanaticism, I am sure. I know how we are about our food. I have very clear memories of envying certain school friends’ cheese paste sandwiches because they always seemed more interesting (or different) with textures and green and red bits that provided crunch and flavour. I liked Mom’s cheese paste, but remember with 4 children, you tend towards the basic to satisfy their individual pickiness, so we didn’t always have those colourful additions. Speaking of individual tastes – it’s no secret in my family that we tell Mom she indulged the boy. He was her youngest after all. And battled with the 2nd youngest for most picky eater. She’ll say it was Lilandra, but who went for years eating only yellow roti and curry mango? or only drinking ovaltine or eggnog? That’s right Mom, it was your son. Your son, whose personal request when he was in First Year Infants, had me, at the senior end of primary school, in Standard Five, opening my lunchkit to find sandwiches with bright blue plasticine filling. Sigh. Blue cheese paste. I swapped lunch that day, because once I made that association, there was no returning. Other students didn’t necessarily find it that odd; blue was a rare choice, certainly, but colouring our cheese pastes was entirely normal in T&T. Who ever went to a school bazaar tea party and got served only yellow cheese paste sandwiches? Oh no, there would be 3 or 4-layer sandwiches, crusts neatly trimmed, each layer a different colour, usually yellow (natural) and pastel pink and green. All very festive. Food colouring never really affected the taste of the cheese paste, so you could do what you wanted if you were creative. A good cheese paste transcends childhood, however, especially when your tastes have matured to liking the bits of carrot and pimento peppers, spiced up with a good pepper sauce and mustard. Mmmmm… Some people may add celery and maybe green peppers, but with the latter, there’s too much water content and the spread can go bad faster. We zap ours in the food processor, and it comes out smooth and creamy, fairly quickly (although cleaning the blade afterwards is tiresome). But traditionally, before such appliances, grating the cheese and other ingredients sufficed, and the additional texture (not to mention thickness) makes for a great sandwich or filling. 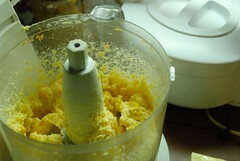 Food processors are good if your butter is still hard, and you don’t like chopping or grating carrots etc. There’s no need to add milk or mayonnaise, if you experiment with the proportions of cheese and butter to your liking, you’ll make a great spreadable paste without those ingredients, which may change the taste and shelf life of the sandwich in the hot sun. We like mustard as a complement to many cheesy things (see Lilandra’s macaroni pie recipe for example) but I guess there may be some people out there who don’t…feel free to add your suggestions for additions to cheese paste. Process carrots and pimento peppers until fine or desired size. Add cheese and butter and process until smooth and well combined. Taste the mixture at this point to determine if the proportions of cheese and butter are to your liking. Add remaning ingredients and process until combined. Alternatively, let the butter soften out of the fridge. Then grate the cheese and carrots, chop the pimento peppers finely, and mix all ingredients to a paste. Store in a sealable container in the fridge for up to a week (undisturbed or in the freezer, you can keep for longer). You will need to take out and bring almost to room temperature for it to be spreadable, however, so take out in small batches unless you’re making loaves of sandwiches for a beach lime, or the Oval. 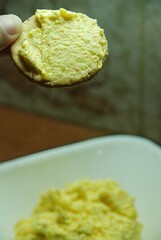 Edit #2 [When I decided to blog on Cheese Paste, I didn’t think it was necessarily suited to a fixed recipe. Frankly, I wasn’t sure it would be an interesting post, or fill any need. When Lilandra and I were called upon to make some cheese paste sandwiches for my brother and family (for their 2-day travels), I decided this was something I needed to document. And I love the comments and now I see that there are apparently people searching for “cheese paste recipe”, so I am glad to be of service. This entry was written by Chennette and posted on February 9, 2008 at 8:33 pm and filed under Caribbean, food, photos, recipes, Trinidad and Tobago. Bookmark the permalink. Follow any comments here with the RSS feed for this post. Post a comment or leave a trackback: Trackback URL. I’ve already had one comment on Flickr, possibly questioning the carrot, and being pro-mayonnaise – she’s Jamaican, but I am sure there are Trinis who think that way. Whenever we made cheese paste sandwiches in bulk, there’d be fights over the ends of the bread for eating right away. Or wishing for uneven number of slices in the loaf…more sacrificed to the immediate consumption of freshly made cheese paste. Mmmm yum,this is almost exactly as I make it! I also do versions adding cream cheese and chives, good quality blue cheese, or chopped mushrooms. Havent made cheese paste for months,so maybe I’ll do it again soon! Best cheddar brands for this-Anchor or Kraft/Cracker barrel sharp/extra sharp. aka_lol – hmmm, sugar. I don’t think I would have had the guts to try the sugar…but who knows, I may have had it already! and I think I should add to the ingredient list, possible green seasonings depending on the mood – chives, parsely, chadon beni, even the celery leaves would go well. Growing up we would say ‘cheese-space’, as if it were one word with a hypen in it. I love ‘cheese-space’ sandwiches. We grew up with the carrot-grated-in-it version, ensconsed in hops bread.. I sort of feared the brightly coloured pinwheel or triangular ones, and never – to this day – am attracted to them. But I love love love crix and ‘cheese-space’ with the mayo and pimento – thankfully I’ve outgrown the carrot! iz your time in Jamaica, nah? I like the idea of colorful cheese. I must have the mayo, though. And a bit of onion in the mix. Yum. alright alright I accept that people like mayo in the cheesepaste…onion though…not a fan of raw onions, but I can see where people who don’t have my hangups could enjoy the combination of cheese and onions. cheese paste is such a great concept. we make it with low-fat cottage cheese sometimes. it’s very versatile too. so far, I haven’t really experimented beyond the traditional cheese paste – most likely because my experimentation era coincided with my sinus allergies, and cheese was the biggest trigger. I look forward to trying new things though. We do have very similar cheese-paste experiences, especially with the multi-coloured sandwiches which I always found attractive. I’m lactose intolerant so I have to monitor my dairy intake but there’s nothing quite like a good cheese paste. I’ve never had it with carrots. Mom always used to put a couple of boiled eggs in with her cheese paste and I loved that with the flecks of egg whites, the yolks added to the smooth texture. So apart from the cheese, boiled eggs, butter, mustard, salt and hot pepper, nothing else was added. Later on though, I would fold in thinly sliced green onions. thanks for the comment Cynthia, especially the description of your variation! Everyone should try carrots – they have colour and crunch. we wanted coloured cheese paste sandwiches like everybody else in school and mom only had BLUE!!!! I made cheese-paste yesterday-first time in about two years. Luckily, as I got the cold and that was the only food I felt I could eat ( with whole wheat crix). Blue cheese paste! Reminds me of going to little parties when I was small and you would get piece of sweet bread some popcorn and a bread and cheese paste.I saw all the colours… green, pink, red, and of course blue. So you’re not alone. Me personally I like mine with grated carrots and slight pepper with of course a plate of CRIX. I just like how the pepper and the sharpness of the cheddar bites your tongue. I Haven’t had cheese paste in so long and people here don’t seem to know anything about it! 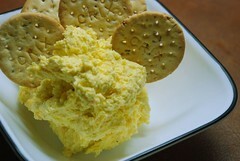 When I googled Cheese paste i never had a clue I’d find a Trini site and recipe. I’m Trini, needing to make some sandwiches for my sisters graduation, so I was delighted. But more than that, I’m delighted by the site! Keep it up! 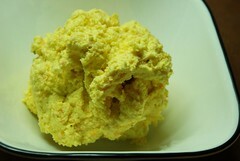 Thanks so much for putting up the cheese paste recipe! I live in the US now and my kids love to try new Trini foods! (in fact I was looking up your paratha recipe when I found this one. Your paratha recipe is the only one I use). Anyway, I see a food processor in the cheese paste post. Is that absolutely needed? Or can I get around it somehow? Hi Nika – Thanks for the nice comments! And no, you do not need a food processor. You can grate the cheese and carrots, chop any other ingredients finely, and make sure the butter is soft enough to mix into a paste. my website is not cooking it’s health and beauty, but the cheese paste taste good, it was my first time making cheese paste. I love this! I googled cheese paste and your site and recipe pops up. Best of all it comes with a story, like most Trinidadians, everything comes with a back ground story. Any hoot I am going to use this recipe, as is or sans carrot, for my Dancing Queen Party on Friday. This will make a great addtion to my appetizers and cocktails. I am putting them into puffs. Thanks again from one Trini to another Trini. Hi Camile and welcome! Yes, I really think more Trinis should be blogging – an unfettered opportunity to pontificate and do some story-telling, what better than that? good luck with the party – I assume it’s ABBA-themed? 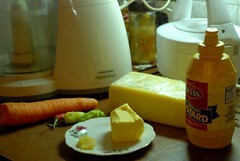 Hmm interesting cheese paste with carrots and mustard and magarine I never heard of before. I’m from Trinidad and this is new to me, also I found it so interesting to see so many trinis not liking the concept of having mayo in their cheese paste. How I learn to make cheese paste is by grating the cheese adding mayo a little bit of mustard just enought to get the colouring right, grating onions for a little flavor and adding a little bit of sugar oh and also adding pepper sauce for a nice spicy taste. Trust me it comes out well because my mom use to get people hooked on them. I will also try your recipe just for a change i’m not sure if I will be a big fan though because cheese paste without mayo to me foreign. Hi Andrea – I have probably had that kind of cheese paste before – where it’s cheese with mayo and the other flavours. I’ve never liked the taste of mayo with the cheese paste though, but I guess it depends how much you put in. Actually, the 2 main Trini voices against mayo in the comments, are me and my sister, so it’s a family thing most of the others support mayonnaise in cheese paste! You’ve really never had cheese paste made with butter? See, sometimes it seems T&T is bigger than we think, with all these variations 😀 Let me know how your foray into cheese paste with butter goes! I’m not a Trini, but and American married to a Trini, and I guess I have adopted cheese paste for my very own. It’s a simple version she taught me to make: cheese, mustard, butter, pepper sauce. Very delicious. I think I might even be able to make it for my in-laws with some success. Making it in a food processer is a great idea! (certainly makes the grating cheese part into a joy since it only takes about 20 seconds to shred a pound of cheese). Thanks for the article, it was great. Now I will have to go over to check out Lilandra’s Macaroni Pie Recipe. Hey Drew! I see you’ve got the basics for great cheese paste down already Food processors are great – you can get such smooth spreadable texture (if that’s what you want of course) even if you add the “frills” like veggies of some kind! Omigod I remember my mother making yellow and green cheese paste sandwiches for every birthday party I had as a child. good times, good times. Thank you sooo much for the recipe. I’m Guyanese and was googleing cheese paste and this one came up. This is the closest to the Guyanese recipe that remember except I don’t think we use carrots and colors but we use onions or green onions. I like making it with Cabot’s Seriously Sharp or Extra Sharp (Anchor is too expensive in Orlando) and I just use some of their Pepperjack for the hottness. However the first and last time I made it I tried to use blender to avoid grating and it ended up coming out like Velvetta due to over blending and had people and my masjid asking me “is this halal?”. I totally lost the consistency of real “cheese space” BTW readers Cabot’s, like Anchor is Halal and can be found just about everywhere in the US. assalamu ‘alaikum Lianne – nice to have you drop by. My sister, Lilandra used to buy the Cabot cheeses when she lived in MA – extra sharp sounds like good flavour. in any event, achieving velveeta doesn’t sound like such a bad thing! a blender was probably overkill, a food processor is perfect – and no grating there either!! weyy, I have never tried that! yuh mean, one day I could go somewhere and instead of being offered the usual cheese paste OR tuna sandwich I could get a cheesepastetuna sandwich??? I’m a Trini-American and I surely remebered acquiring a taste for those spicy cheese paste sandwiches. It’s been years since I had one until recently I was at a Trini friend’s kid’s party and to my surprise they were passing out those lovely trimmed triangle filled with spicy cheese paste. It inspired me to search for variations on the recipe, so thanx! Thanks Glad you liked it. Crix is the best!! I also put some milk (in substitute of mayonnaise) to add moisture(?) when making the cheese paste. Oh my goodness. Thank you so much for this!!! This is exactly whate I needed. I’m having a couple guests over today and had no idea what to make for a snakck. Someone suggested that I make cheese paste and put it in sandwiches. I have no idea how to make it and googled and here it was! I’m also Trini, so this worked out wonderful. You are very welcome Hope it turns out well! today i made cheese paste for the first time in years and about the green peppers comment well i roast them before adding them and the flavor is really nice but the secret ingredient is that bitters if you dont like the sharp taster of the chesse i find that it cuts it down a bit well, thanks for this site good to know you can find a site like this. yay!! So thrilled to have this! My VERY VERY picky eater – 7 year old son – and I just got back from a family cruise to the caribbean, where he and I did a special excursion in antigua snorkeling on a catamaran. They provided us with these funky cheese sandwiches, which my son has continued, for days now, to ask me to get the recipe so that I can re-create them for him. i use mayo instead of butter and include grated onions and carrots, finely chopped pimentos and green peppers, and thinly sliced celery stalks and stuffed green olives. plus i don’t grate the cheese too fine. and of course mustard and pepper sauce. it’s really nice and tan1gy, has a good deal of body, some crunch to add interest, and pretty to look at. try it between a hamburger bun(be sure to get the one with the seeds on top) with a leaf of lettuce. and don’t worry, if you make the sandwiches the night before and leave them in the fridge overnight, they keep all day in the sun (just don’t include the lettuce). Happy for this. Thanks. ‘Cause I am planning my daughter’s 6th bday party and I want to use recipes from my childhood. I added more cheese because there was too much butter. But overall, it was good! Thank you! Spent Christmas 2013 at home in Trinidad. Being there for the Holidays brought back many found memories. For new years I asked my long time friend and neighbor to make cheese sandwiches they were the best. When I was leaving to return to the US my best friend made me some sandwiches for my trip. This was the best since the airlines don’t serve meals. I was looking for the cheese paste recipe and found your blog. Hi Marcia, glad you found the post and blog! Welcome. I have been dreaming recently of making a sada roti stuffed with cheese paste. Your comment has brought it back to mind! « For all you know, I may really be a Rock Star!